I finally figured out a way to interperet the CMB data. I'd thought that it might be possible to relate the x axis, the l values, to frequency by regarding the arc of the circle defined by angular resolution (ie l) as wavelength. Well, half a wavelength actually, half a cycle of a sin wave. The problem was I wasn't sure if this actually had any sound mathematical basis. Having looked over my notes about this yesterday I managed - with help from Constantinos Skordis and Dan Hooper - to construct a "proof". The standard cosmology does a remarkable job at explaining the gross features of the universe from a few simple principles. One starts off with Einstein’s general theory of relativity and the physics of gases at different pressure and temperature. One then makes a crucial assumption, that the universe is completely homogeneous and isotropic. A homogenous universe looks the same at every single place. For example the temperature, or the density of electrons, is the same wherever we look. The temperature may decrease with time, or the electrons may become more dilute, but this happens the same way, everywhere. An isotropic universe looks the same in all directions. In other words if we swivel around at any observation point, we always see the same thing. With these assumptions it is possible to construct a cosmology, the Big Bang which can predict a number of features: the fact that distant galaxies are moving away from us, the ambient bath of fossil radiation left over from when the universe was 300,000 years old and even the abundances of the lightest elements of the periodic table. The assumption of homogeneity can only be an approximation. The real universe is far more complex, with structures spanning the whole sky. We see a wealth of stars, stacked into galaxies which themselves swarm around in clusters. All we have to do is look at our own solar system to realize that the universe is clumpy and not smooth as the Big Bang cosmology would have has assume. One of the outstanding questions in contemporary science is what is the origin of this large scale structure? If you just think about it naively, you come up with two possibilities. The first possibility is that the universe started off in a completely chaotic mess, very much like water in a thunderstorm. Slowly but surely things would have evened themselves out on the largest scales to look smooth while the restless beginning would have been left imprinted on the smallest scales. Order would have emerged from chaos. We know however that this is not possible. On the largest scales, the dominant force is gravity. Gravity does not smooth things out. On the contrary it tends to make things more and more clumpy. To see this, think of how it works. If you have two objects of a given mass they tend to attract each other and clump together. The more massive an object is the more efficient it is at attracting other stuff to it. So if you start off with some stuff thrown around, with some regions having more mass than others, gravity will tend to push it around so the that more massive regions get even fuller while the empty region become even emptier. If we start off with a chaotic set of initial conditions, gravity will ensure that the universe becomes even rougher. It is not possible to make it smooth on large scales with gravity alone. From the above description, it should be possible to see what the viable alternative is. We can start off with an almost perfectly smooth universe and lay down very small initial irregularities. As if they were small ripples on what is otherwise a very placid pond. Gravity will do its job and, slowly over time these irregularities will build up to form big peaks and valleys. The peaks are where the galaxies will accumulate while the troughs will become large expanses of emptiness, voids in the distribution of matter. As long as we have the right initial seeds, gravity will do the job for us. Until the early 80s, the initial seeds were put in by hand. There were some half hearted attempts at proposing a mechanism for generating them, but nothing really worked. In the beginning of the 80s, a number of people (Guth, Albrecht, Steinhardt, Linde to name but a few) proposed that the universe underwent an incredibly short period of very fast expansion. During the period of expansion, a small patch of the universe was blown up to gigantic scales. Such a small patch of the universe could have undergone many physical processes before it grew and it would possible be smooth. The only roughness left in it would be due to the inevitable bubbling that comes from quantum mechanics, the quantum noise of the fabric of space and time. This period of expansion, known as inflation, would stretch and amplify these quantum ripples to cosmic scales. After the end of inflation, these ripples would be left to trigger the gravitational growth which leads to the galaxies and clusters of galaxies we see today. Inflation as the origin of cosmic structure is highly speculative but it is, by far, the best worked out theory we have. A cause for concern is that it is the only theory on the market at the moment with any level of rigour. This is not to say there aren’t competitors. For example, a possibility which has recently been proposed is that our universe is but a slice, or membrane of a higher dimensional universe. Our universe can slap into another membrane and in the process, ripples can be set up. Just as in inflation, these ripples then seed structure which grow through gravitational collapse. But we would like to have more alternatives. At the very least, to be sure that inflation is the most plausible. I schlepped a PA system - speakers, mics, mixer, amp, leads - by foot, tube and train from NW5 to Oxford. Like an ant I negotiated the hazards of the English transport system. By the time I got into the Astrophysics department the wheels I'd bought to trolley the eqpt. - guaranteed for 5 years - were on their rims. What could be more relaxing then than to attend a brown bag seminar. (A brown bag seminar is a seminar where you can bring a brown bag with food in it. Being held at lunch time it's a kind of kill two birds with one stone thing, whereby you get to listen to an interesting talk and don't have to pass up your lunch). The subject was "Fluctuations in cosmology at large scales : a statistical physics perspective" and ran along at a brisk pace soon leaving me somewhere in its slipstream. Discussing a statistical way of looking at / looking for (?) fluctuations in the CMB I thought it might help me in my quest to extract sound from CMB data (see previous entries). It didn't but once I was well and truly lost I looked back through my note book and reread my CMB data to sound notes which oddly enough started to make more sense. Things started to pile up : I had to look through 50 or more images so as to be able to help in the process of choosing which lucky ten would grace the walls. I had to go into town and sort some things and then go to the Ruskin and meet RW. Then go to a mystery second talk of the day with him, then rehearse. Onwards . . . the mystery talk was Brian Catling : Arthur Worsley & the Uncanny Valley, the first of six lectures on ventriloquism. Wonderful. By the time I got back to the department the list of images had arrived but there was no time to look through them, had to eat and then time for rehearsal . . . with Dan Hooper, Constantinos Skordis, Jo Dunkley and Lee Clewley aka The Outer Headingtons (thanks Marcia !) / The Oxford Pulsars / The Astrophysicists . . .
We set up our gear in the cafeteria, Dan and his Marshall stack, Constantinos and his slightly smaller Marshall combo, Jo and her cello, miced up via an improvised stand of the wheels laid over the trolley laden with dirty tea cups, Lee with his bongos and me with a mic and banjo. Learned 4 songs, Mr Spaceman, Sputniks and Mutniks, Girlfriend stole my Alien and Shootin for the Moon. A glorious racket ! Finally got to start going through the images at 00.30 ish and finished about 2 hours later. Another office, room 708, 2 astrophysicists in relativistic motion. Now reading "Hyperspace" by Michio Kaku which seems to be quite approachable and interesting so far on the subject of higher dimensions. In trying to visualise the 4th spatial dimension, which we can't apparently, I found some interesting websites. To see a hypercube, a 4 d cube, this site is pretty good. The problem is you have to either render yourself boss eyed - which hurts my eyes - or wear 3 d specs.Which I don't have. They do however provide a link to a website who will send you a pair for free. Something in Janna's book that has started to worry me is her discussion of free will. I always had assumed we had free will but I'll have to re read those bits which question this basic assumption through a discussion of the implications of quantum mechanics, chaos etc. I'd like to think that a totally pre determined life is not possible due to quantum fluctuations. ie they'd always knock one slightly off kilter, off the path. Going with the flow, that relaxed approach to life which seems appealing - at least some of the time - might actually be capitulation. Going against the flow might be necessary from time to time to establish that one has free will. But that urge might be some predetermined brain spasm. A whole month has gone by, the black hole of christmas. Not that I've been idle, oh no. When the festive season was finally over I went to the Red Sea for a weeks diving. It's the nearest I'm probably going to ever get to floating in space. At night, with ones torch turned off and away from other light sources - divers, the boat etc - one is alone in space, floating. Floating in space, with all forces equal upon ones body, one could be in the black depths of intergalactic space . . . . well, sort of. I re read Janna's book, "How the Universe Got it's Spots", and a lot of things seemed to make more sense than the first time. Some things I thought I understood I realised that I'd only taken in good faith. Like the fact that according to special relativity the faster one travels the slower time passes and objects become shorter. I'd never twigged that if time and space are not absolute and the speed of light is, then quite simply time and distance have to change the faster one travels. How thick is that ? Probably not too thick - it's easy when these things click, but it now seems so beautiful in it's simplicity. The topological and spatial dimension stuff made more sense too, and I realised that in my musings over making model universes out of mirrors there was a fundemental flaw. 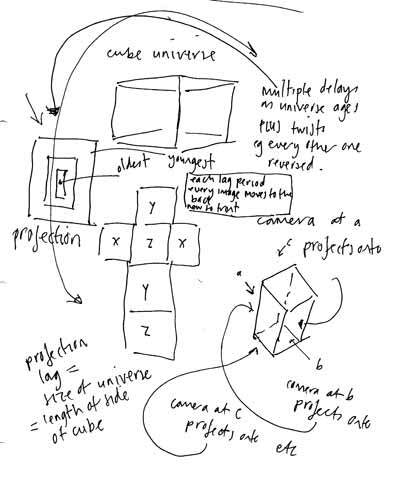 If one lived in a universe that was a cube, with opposite faces identified - so that if you walked through the right hand face of the cube you'd reappear through the left hand one - you wouldn't see a mirror image of yourself, you'd see your back view. Light would travel round the universe from behind you and appear in front of you. If you looked up at the roof of the cube you'd see your feet. So mirrors are not the way to make such a model. Probably have to do it with cameras and projections. If the size of the universe, the length of the cube was, say, 1 light second, then you'd see yourself as you were a second ago. And each second you'd see a new old you with the previous you receding - 2 seconds ago, then 3 and on and on . . . In this way it would look a bit like mirrors feeding back into each other. I think. Anyway I'm thinking that this could work : for each face you have a video camera pointing out from it with its output projected onto the opposite face delayed by the size of the space. (To be realistic in the size of space available it's probably a good idea to scale this. Call it x seconds for now. Otherwise the time lag will be too small to notice. Unless one projects onto the moon.) Then every x seconds cunning software starts playing back the buffered footage from x seconds ago, while all previous streams are moved further into the background. So you see what appears like ever increasing multiple versions of yourself getting further and further back in time as light circles the universe. Actually projecting onto the moon could be pretty interesting, you could actually see a slight delay as light travelled there and back, see the speed of light.